If you are a property owner, today is a good time to inspect your driveway and walkways. Even if you worked hard to clear all the snow yesterday, go out and take a second look. The deep freeze is setting in and more snow is forecast for tomorrow, creating the potential for slip and fall accidents. Why is this important? In addition to making it easier for your family to come and go from your home, you have a duty to use reasonable care to clear snow and ice under Massachusetts law. If you neglect this, you could be liable for any injuries that result. 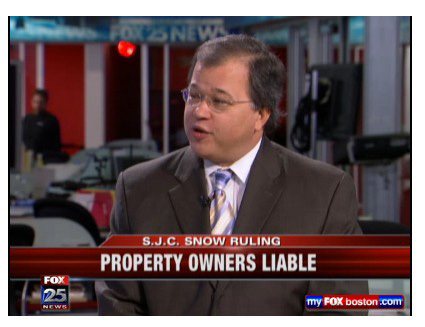 Massachusetts Law on Snow and Ice Removal The law for clearing your property is more strict than in past years. It changed in 2010, with the Massachusetts Supreme Judicial Court’s decision in Papadopoulos v. Target Corporation, SJC-10529 (July 26, 2010). View TV interviews from 2010/2011 in which attorney David White explains the law. Prior to then, property owners were liable for injuries sustained on what was known as “unnatural accumulations” of snow or ice. Examples of this are gutters leaking onto sidewalks or snow piled on sidewalks. The state’s high court changed the longstanding law so it falls in line with other states. Massachusetts property owners now have a responsibility to keep their premises in a reasonably safe condition and clear all snow and ice, whether it is a natural accumulation by Mother Nature or pushed there by a plow. This law applies to homeowners as well as commercial property owners. You have a responsibility to clear your driveway, sidewalks and other areas accessible to the public. If you are using a snow blower, remember a shovel for narrow and hard-to-reach areas. Do you have the physical ability and time to clear your snow this year? If not, consider contacting a snow removal company. Cities have responsibility for clearing sidewalks, but some have ordinances requiring residents to clear their own. These include Boston, Worcester and Newton. We all have to balance our legal responsibility to clear the snow with safety. It is hard work and tempting to take shortcuts at times. Remember a few basic safety rules. Do not start your snow blower in your garage or other covered areas. Before you shovel your driveway, clear your home’s heating vents so carbon monoxide does not build up in your home. Then, make sure you dress in layers and take breaks as needed. Snow removal law may face test, Boston Globe, Dec. 25, 2010. The Boston snow and ice accident lawyers at Breakstone, White & Gluck have over 100 years combined experience handling slip and falls in snow and ice. If you have been injured, it is important to learn your rights for seeking compensation. You may have a limited period of time to file a claim. For a free legal consultation, contact us at 800-379-1244 or 617-723-7676 or use our contact form.